To see a complete list of grant recipients since 2011, please click here. October 22, 2018, our recent grantees share their stories with us. Thank you to all of our participants for sharing their stories on Oct 22, 3018 at the Bradley Street Bicycle Co-op. Thank you to New England Brewing Company and Da Legna Pizza for helping us provide delicious and tasty refreshments! In the Spring of 2012, Solar Youth received a grant from the Greater New Haven Green Fund (GNGF) that allowed them to offer the environmental education program Citycology in three neighborhoods: Westville Manor public housing development, McConaughy Terrace public housing development, and, for the first time, Newhallville. This was the first season in which Citycology was offered in the new Newhallville site. Over the course of the grant period, Solar Youth hired and trained 36 Youth Educator Interns who delivered hands-on environmental education programming to youth between the ages of 4 and 8. The program saw a total enrollment of 168, including 39 in the West Hills neighborhood and 22 in the brand new Newhallville site. Citycology youth explored their community through neighborhood scavenger hunts and nature walks, as well as through adventure trips like apple picking at Lyman Orchards, hiking in Sleeping Giant State park, and playing field games at Lighthouse State Park. Additionally, Citycology participated in Solar Youth’s annual Youth Summit, a three-day adventure revolving around a certain theme; in 2012, the theme was Big Food - youth explored the environmental ramifications of the food industry and how to eat healthily! In the fall of 2015 Massoro Community Farm (MCF) received a $2000 grant from GNGF. With this money, MCF was able to plant 8 species that complement the farm space, nearby field use and that would be useful in farm-based education: Witch Hazel, Staghorn Sumac, Beech Plum, Ninebark, Virginia Sweetspire, Samantha Hydrangea, Gold Flame Honeysuckle, and Clethra. These particular plants were also chosen to provide a variety of height and structure on the north side of the farm, including the two witch hazel trees, which will grow to approximately 12-15 feet. The variegated structure also further supports Massaro’s position as an ideal location for diverse bird population due to its mixture of open fields, shrubbery and woods/wetlands. MCF was then able to use the remaining grant money to purchase large signs providing educational information about each native plant. Since the installation of the planting, MCF has conducted more than 20 youth-based farm field trips, hosted a spring migratory bird walk under the leadership of New Haven Bird Club, and held two farm tours in connection with the 2016 International Festival of Arts & Ideas. This is just a small sample of events and engagement that have since take place at the farm that incorporate what it means to have a biodiverse landscape that works with the land, minimizing the need for special maintenance, water or chemicals. Thanks to a $10,000 grant from the Green Fund made in the Spring of 2011, Common Ground students were able to take on profound environmental issues and completed projects with significant environmental impact as part of their core academic courses. In the biodiversity course, students explored and analyzed biological diversity on Common Ground’s site, in the forests of West Rock, and in the City of New Haven. In Spring 2012, Biodiversity students shared their understanding of local ecology by creating 20 interpretive signs about trees in the part of West Rock Park adjoining Common Ground’s campus – creating a mini-arboretum for the 10,000 annual visitors to our site. Green Fund support paid for these new outdoor exhibits. Photos of these exhibits and other projects are online. In Spring 2013, Biodiversity students took on another public education and conservation project – focused on renovating and improving a schoolyard habitat located directly outside one of our science classrooms. With Green Fund support, students planned and built new bird feeder stations in this area, part of a larger effort to improve wildlife habitats across our site. These same students worked with a landscape architect to finalize plans for an ambitious set of changes to Common Ground’s site – including an educational wetland, rain gardens, vegetated swales, ½ acre of native plantings, and a series of interpretive signs – which will be installed over the next year, and which created educational opportunities for thousands of community members each year. Because of these projects, 100% of Common Ground students submitted rubrics, artifacts, and reflections to their e-portfolios that demonstrate how their classroom experiences led to growth in their leadership capacity. In May of 2012, the Greater New Haven Green Fund released a $10,000 grant to the New Haven Land Trust to make improvements to the Land Trust’s Long Wharf Nature Preserve. On October 15, 2015, members of the Land Trust and the public celebrated the unveiling of the six educational signs, and walked the gravel trail loop, including a new bridge, as they enjoyed the spectacular views of New Haven Harbor and Long Island Sound. The goals of the project were to make physical improvements to the preserve that would make it more attractive to the public and thus increase usage, and to engage people in the project and thus serve to strengthen our partnerships, provide educational experiences for the young people involved, and build ownership and involvement in the Long Wharf Preserve. The Land Trust completed the following physical improvements utilizing the grant funds: 1) a new footbridge, 2) trail loop maintenance and construction, and 3) educational signage replacement. The Land Trust worked with a variety of partners to make this project possible. Some of those partners were: The Sound School, Yale Peabody Museum, Design Global Change, Gateway Community College, and the Land Trust’s own Preserves Volunteer Crew. With the support of the New Haven Green Fund, URI was able to assist community members in obtaining 17 soil samples from New Haven yards to be tested for lead levels, and of these, URI identified 16 sites as eligible for remediation and restoration. URI provided one yard with minimal treatment for the lowest level of lead, while it provided three homes with low to moderate treatments consisting of 1 inch of clean soil covered by a durable grass, mulch or stone and hardy shrub plantings. Nine homes received moderate to high treatment consisting of 3 inches of clean soil, 2-3 inches of gravel and hardy shrub plantings, and three homes received high-level treatment. This consisted of excavation and replacement of soil found within 4 inches of the surface, grass seed and heavy mulch application and planting shrubs in drip-line. Because of these treatments, URI propagated over 500 plants, and distributed 30 yards of topsoil and gravel. Solar Youth proposed the Beaver Pond Stewardship Initiative to reach up to 30 youth ages 4 to 13 using Beaver Pond as the basis for learning about their environment and stewardship. Among the completed Community Service Action Projects was a trail cleanup where Stewards cleaned up trash and removed 3 bags of trash from the woods neighboring their homes. They learned about the way pollution interferes with animals’ lives and water cleanliness. 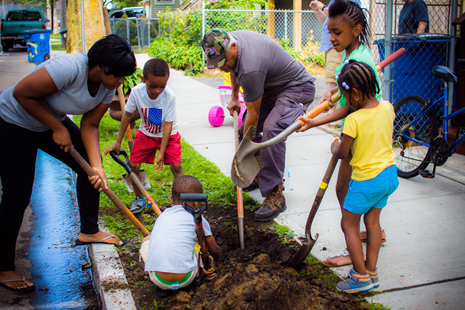 Stewards presented their cleanup efforts to an audience of families, Citycology stewards and Solar Youth staff at a Public Education Project. interactive and engaging for the group. Lastly, Explorations included a full day at the Maritime Aquarium, program-wide trash clean up at Beaver Pond in Newhallville, in partnership with Friends of Beaver Pond; fishing and hiking around Lake Wintergreen; and exploring Outer Island. In 2011, New Haven Leon Sister City Project (NHLSCP) received a grant from GNGF that enabled the Project to conduct an extensive outreach campaign and to begin using public art that invites residents to cut car use and reduce greenhouse gases (GHG). The Project organized two public “swarmings” in November and December that generated a significant amount of media and public interest. Since then, NHLSCP organizers invited schools and children to make over 800 butterflies (received from Westport, Bethel, Fair Haven, Middletown, Environmental Justice Day at Peabody Museum) for a Spring campaign of swarmings. They then researched and designed a poster to educate the public about climate change and to encourage specific GHG reduction strategies. The poster and an accompanying flier were part of an effort to get non-profits and other institutions to take specific actions to reduce GHG. Because of the grant from GNGF, the WalkBikeTransit campaign made considerable progress towards achieving its goals, and as an organization NHLSCP was able to deepen its commitment to limit greenhouse gases and the resulting economic and environmental damage of climate change. 1. A youth-oriented push to promote helmet usage the fitted and distributed free helmets. Haven to build 4 protected bike lanes in the city by 2020. 3. Two pop-up temporary bike lanes built by the neighborhood. The Connecticut Coalition for Environmental Justice (CCEJ) conducted a very successful asthma outreach and education project in New Haven from March 2012 to August 31, 2014. CCEJ’s trained community volunteers made presentations at venues throughout the city to educate their fellow low-income residents and neighbors of color about the risks asthma presents to their health. In their presentations, these Speakers told community people that environmental exposure - including emissions from power plants and city traffic act - as asthma triggers. The Speakers targeted their outreach to caregivers likely to have children with asthma since CCEJ found many of them do not know the signs & symptoms for asthma. The volunteer Speakers and their audiences shared personal stories about asthma through the presentations; at one event, a person spoke about a relative who had died from an asthma attack due to a pesticide spraying. Speakers also spoke at their church groups and before congregations during “minute permissions”; CCEJ discovered that this church-based outreach reached many more people than CCEJ could have through presenting at other community venues. CCEJ’s volunteer Speakers reported that many in their congregations were still talking about asthma long after hearing about the presentations on the theme. By the project’s end, CCEJ’s 12 volunteer Speakers had spoken to more than 1,400 city residents on asthma. opportunities for community members to become involved. coverage of this grant on the New Haven Independent and New Haven Register websites. 3. NHF Supported 50 families in the Farm-Based Wellness Program with education and a full weekly share of fruits and vegetables for eighteen weeks. community around the new Ferry Street Farm. 5. NHF produced 13,500 pounds of food on less than one acre. This produce was distributed to the 50 families in the Farm-Based Wellness Program, 20 full-pay CSA members, New Haven restaurants, and weekly contributions to the Loaves and Fishes Food Pantry at the Episcopal Church of St. Paul-St. James. This project was funded in part by The Greater New Haven Green Fund (GNGF) to study the presence of polyaromatic hydrocarbons and phthalate plasticizers in water and sediment from the Quinnipiac River as it flows through Wallingford, North Haven, and the tidal marsh on its way into New Haven harbor. The project period for this investigation was May 14, 2013 – May 13, 2014, and a final report was issued in June 2014. The Principal Investigator for this research project was Dr. Harry Pylypiw, who supervised a Quinnipiac University undergraduate student, Jessica Frick. Together they conducted the research as part of Ms. Frick’s chemistry program research degree requirements. The NHGF helped to provide partial funding for Ms. Frick’s undergraduate student stipend and helped to defray the costs of disseminating the research results on the analysis of the Quinnipiac River and its watershed. A grant from the Greater New Haven Green Fund are helping EcoWorks to strengthen and build capacity within the organization, and to improve the efficiency of its organizational systems to ensure the creative reuse center project expanded and reached a scale that was much closer to being financially sustainable. During the initial phase following reception of the grant, EcoWorks moved from its space at Boldwood Interiors at the end of July 2015 after their lease was expired. In July 2015, EcoWorks found a new location and began moving into its new space at 262 State Street the first week in August. EcoWorks successfully opened October 1 when it hosted an On9 event as well as LAMPFest. Overall, the move to 262 State Street was an incredible success. EcoWorks’ new space totaled 1600 square feet and included a bathroom, small secure office and a supply closet. With this new space, EcoWorks laid out their plan for the store to include ample space for the reBoutique, space for crafting and space for processing materials, which included a sink for messy crafts and/or the ability to clean dishes from food events. After receiving a grant from the Greater New Haven Green Fund, New Haven Urban Resources Initiative’s (URI)Community Planning with Greenspace project were able to improve communication, preparation, and the experience of Greenspace participants, interns, and managers. The program allowed managers and interns the opportunity to sit down and meet with Greenspace Leaders before the Greenspace season began to hear issues, concerns, dreams, and to answer questions leading up to the 2014 Greenspace season. Staff members Chris Ozyck and Anna Pickett along with Gina Blankenship and Sumana Serchan (who were Greenspace interns in 2013) conducted renewal interviews with Greenspace groups in April 2014. The process involved reaching out to Community Greenspaces, meeting with leaders in most cases and occasionally with members, asking a set of questions that addressed the following: highlights of the groups’ work, reflection on values and benefits, impact of their work in the community and environment, and assessment of the groups’ needs and goals for Greenspace season 2014.